CHICAGO -- It might not seem possible, but Jonathan Toews is getting even better. At least, that's what Chicago Blackhawks coach Joel Quenneville said about his 23-year old captain and first-line center. It seems that Toews isn't satisfied with the Stanley Cup title he helped bring to the Windy City in 2010, nor the Conn Smythe Trophy as MVP of the playoffs that came along with it. He wants to do a lot more and it's the team-oriented goals that motivate him most -- despite his current pace to have his best NHL season as an individual. Heading into Tuesday night's game against the Phoenix Coyotes at the United Center (7:30 p.m., FS-A, CSN-CH), Toews is on pace for career highs in goals and points. He's already found the back of the net 13 times in the first 24 games, assisted on 12 other goals and put up the game-winning goal in each of the past two games. He also has a team-high 18 points in 14 road games. And those are just the stats that catch most people's eye, the goals and assists. Toews also leads the League in faceoff win percentage (65.1) and has an impact on virtually every area of the ice. "Johnny is a top player in our game, and I think as the years go on he just gets better and better and better," said Hawks coach Joel Quenneville, who doesn't hand out compliments like that very often. "In all areas of his game he's rock solid -- offensively, defensively, faceoffs, (power play), (penalty kill), important minutes … and he leads by how bad he wants to be the best player and how bad he wants to help our team. It's a great position to be in from a coaching perspective, and organizationally we're lucky to have him." The only real luck, of course, was that Toews was still around for Chicago to select at No. 3 in the 2006 NHL Draft. In that draft, the St. Louis Blues took defenseman Erik Johnson with the No. 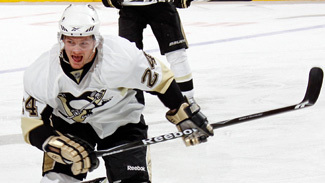 1 pick followed by the Pittsburgh Penguins selecting another center, Jordan Staal, with the second pick. "I always give him (a hard time) about that all the time," said Sharp, who like Staal is from Thunder Bay, Ont. "I tell him they went with a Thunder Bay kid over a Winnipeg kid. He always has good games against Pittsburgh, too." As for Toews actually improving from what he's always been, Sharp said he hasn't really noticed any big change. The hard work is always there with Toews and he knows that eventually it will lead to good things for the Hawks. "I just see the same old guy," Sharp said. "He's on a good run right now. The puck's going in for him. He's playing good and he does lots of good things out there. He plays in every situation and plays a lot of minutes, so anytime you have those kinds of guys on the team they're important and valuable." Recently, Toews has been paired with Viktor Stalberg on the left and either Marian Hossa or Patrick Sharp on the right. The results speak for themselves, as his line produces a lot of scoring chances and is converting more into goals now than in the beginning of the season. Toews doesn't call it a hot streak, though -- just the payoff for their consistent effort at both ends of the ice. "I'm working hard and with my linemates we're earning the success that we're getting," Toews said. "It's not coming out of the blue for us. A lot of people don't see it until you start scoring goals, but you know when you're playing well the whole time. We want to keep that going for a long time … not just for five games or 10 games. We know there's a lot of improvement still left on the table and can only get better."